the nytpicker: Don't Send Jim Roberts, The NYT's Digital News Editor, An Email Or A Tweet: "He Prefers To Be Contacted By Mail." Don't Send Jim Roberts, The NYT's Digital News Editor, An Email Or A Tweet: "He Prefers To Be Contacted By Mail." Got a story idea? 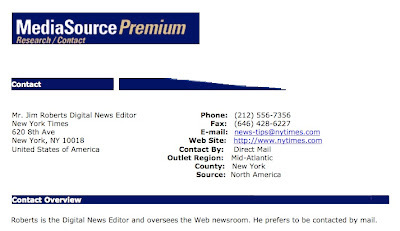 Don't send an email to Jim Roberts, the NYT's digital news editor and the man in charge of the NYT's website. Don't try to tweet him, either. If you need to get in touch, Roberts would really prefer it if you dropped off a letter in the mailbox. Maybe, if you're really lucky, he'll even write you back! Roberts is the Digital News Editor and oversees the Web newsroom. He prefers to be contacted by mail. Now, we have nothing against mail. Frankly, there's nothing we enjoy more than an envelope from Grandma in our mailbox, decorated with smiley-face stickers and the latest Cole Porter stamp from the U.S. Postal Service. But when we've got an urgent tip to pass along to a to NYT editor -- a breaking news story for the NYT website, for example -- it's awfully inconvenient for us to root around in the kitchen drawer for a stamp, envelope, and pen, and make our way to the mailbox. Next time we've got a scoop, we may just be forced to move that plant in the window and go meet with Bob Woodward instead. I like your site, but blaming an individual for how he or she is represented by some dispenser of contact info seems like the sort of error of judgment you'd (correctyly) nitpick the Times for. I get these requests from these contact-dispensers frequently, and ignore most of them. Scoop? This is a scoop? Sigh. Double sigh. May not be a scoop, but line for line, I say Nytpicker is still the funniest media website. My problem is, why so few posts lately? You guys away at camp? Visitng foreign capitals? Come on, we need you!